Bloomfield, New Jersey, sits on the border of Newark, part of the urban fringe. No commercial farms exist here now, and if someone pursued such a quixotic venture, they would not grow wheat. We already have Kansas for that. Still, given the rabid efforts of many Americans in these parts to grow lawn grass, it seemed a reasonable proposition to grow some wheat in a tiny patch of the backyard. Wheat is just grass all grown up. One May afternoon, I scattered a handful or two worth of seeds over a 20 square foot patch, scritched the earth with a rake, and then went about my business. Three months later, I had my very own amber waves of grain fluttering in the warm August breeze. I carefully cut down my wheat, tied it up into stooks and let it dry. A little pride crept in as I admired my stook, my connection to the past, smug as an urban Luddite can be. My smugness would soon be cured. A quaint Biblical expression, easy enough to interpret. The wheat is the solid, good stuff. The chaff is the fluffy bad stuff. Throw the wheat in the air, and the heavier wheat berries fall straight down, while the chaff wafts away with the wind. In the olden days, the collected chaff would be burned, not out of some symbolic representation of Hell, but just as a quick way to get rid of bulky waste. So on Sabbath you head off to church, root for the the good guys (Yay, wheat! ), tsk, tsk the bad guys (Boo, chaff! ), pat yourself on the back for falling in with the wheat crowd, then go home and munch on some bagels made from, well, wheat. Turns out it's not so simple. While today's pastor can glibly warn his flock to avoid the chaff types, any farmer back in Biblical times knew that wheat did not come in two parts. The chaff is an integral part of the wheat plant, the dry husk surrounding the wheat berry, the part used for food. Before winnowing the chaff from the wheat berries, you need to thresh the wheat. Threshing is basically knocking the wheat kernels off the rest of the plant. Today this is done with a combination reaper/thresher (called combine for short), a machine that can cost well over a million dollars. I was not going to invest a million dollars to harvest a tiny patch of wheat. I got to do it the old-fashioned way--beating the wheat until my arms were ready to fall off. Initially I tried a Wiffle ball bat. Little success. I made a flail--two sticks tied together end-to-end, allowing me to beat the heads of wheat much more efficiently. A flail looks like nunchaku, or nunchucks, for a good reason. Nunchaku were initially farming tools. Flailing is very hard work. I pounded and pounded my small stook. I once shoveled scrap metal on ships in Port Newark. I'm not sure which is harder. The chaff is an integral part of the plant, not some sinister fluff stalking the grain. Separating the wheat from the chaff is not about separating good folks from bad. That's too easy. Before separating a part from itself, you need to break it. Threshing wheat requires violence. The wheat plant is broken. Separating the wheat from the chaff involves breaking one's lesser tendencies from the better. Indeed, the actual separating part is easy. Once the grain is threshed, just wait for a breezy day and toss the threshed grain in the air. The wheat berries will bounce at your feet, the chaff blown away. People once knew this. Wheat and chaff were not distinct elements until after the threshing. The parabolic statement about wheat and chaff reminds us not only that the community is mixed but also that each of us have our own good and bad elements. There is for each of us chaff that needs to be blown away and burned. There is a separation here of good and bad, useful and useless; but it is not like the difference between apples and oranges. Each of us individually is wheat and chaff. I will not likely grow wheat again; I have too little land, and the work of threshing by hand is a bit much for a man in his fifth sixth decade. What do I have to show for it? Well, I have a half pint of homegrown wheat sitting in a Mason jar, enough for a couple of bagels should I grind it into flour. More importantly, I have a better grasp of "separating the wheat from the chaff," and what a loaf of bread meant to my forebears, and still means to most of the people alive today. 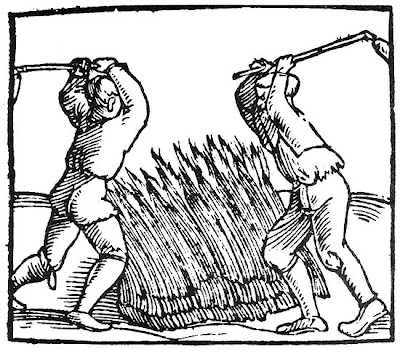 The thrashing woodcut is from a Czech tourism site. My Czech is a bit limited. The wheat stook photo form the National Archives. Could this be the start of creating your own homemade Hefeweizen? I like what you wrote about the combo wheat and chaff in all of us. I've thought about it, but I like other ales so much more. It's hard to do much with the wheat, there's not much there. One thing I have done in class, though, is combine the few wheat berries we could coax from the plants lined up on the windowsills with the wheat berries I keep at home, grind them together, then make bread from the mixture. I told them that the wheat has molecules made from the CO2 that came from mitchondria in the depths of their cells. A lot of the kids freaked out about that, and wouldn't touch the bread, but I think I changed the relationship of bread/world for a few others in a profound way. I hope so anyway. Science gets fuzzy at the borders--and awe is allowed. It's planting weekend for my early crops. Still very cold here in Northern Illinois (snow flurries earlier this week) but I'm planning on heading out to the garden tomorrow. No wheat. No grains. But I intend breathe around everything that goes in the ground. And I'm dreaming of the first arugula. Arugula! I forgot the arugula! I spend the whole winter planning and dreaming, and then mid-March sneaks up on me and I remember everything I forgot. I need to put some more peas in this weekend. A few lettuce plants are growing under the cold frame. Some mornings in school I think would be better spent in the garden, both for me and for my students. We teach our children to depend on somebody thousands of miles away to feed them. That is madness. Thanks for the great post. I enjoyed reading this. My fondness for wheat lies more in the speculative side of the futures market but the next time I go long wheat calls I'll order a bagel, think of this post, and have some more appreciation for the past. I'll be explaining the origins of num-chuks to my seven year olds who are fond of martial arts movies. I have to warn you, though, that if you start paying attention to wheat berries it may wreck your abilities as an investor. Never mind appreciation of the past--the wheat you eat now is as special as the air you breathe, the water you drink. You already know this, of course. We all do. May be more messy than futures, and certainly less lucrative, but should you fall into the rabbit hole, the fall is worth the crash at the end. The last several years I have brought back from our annual pheasant hunt a coffee can of wheat seed from the planter on my wife's uncles's KS farm. I plant it to add some summer green color to the to the winter gray landscape, and then turn it under in the spring as a green manure in my small square foot gardens. This year we left a strip, 5 feet by two feet on my worst red-clayey soil. The heads are heavy, the kids and I will soon attempt to claim enough wheat for one loaf. We often make bread flour from grain using a hand cranked Country Living mill. I hope our first attempt at threshing and winnowing is successful, and further still that it forms a golden memory for my 4 and 7 year olds. Thank you for your entry on wheat threshing. It gives me s better perspective on Gideon threshing wheat in the wine press. I thoroughly enjoyed this. About half–way in, I thought I was reading an article in "The New Yorker." Your story is entertaining, with just the right mix of mass and metaphor for my taste. There are meaningful perspectives we can find therein. I'm sharing on my FB business page. Well met. This was lovely and reminds me of your reaction to the Thanksgiving flowers last year. (Now I can hear it as "MORE wheat seed!" Congrats on the blog's success. Those biblical metaphors carry far more wisdom than our modern minds recognize. They were intended to hit home because they spoke in terms the farmer, the shepherd, the potter, etc. could really understand. Funny how the stepping stone in one era can become the stumbling block in another. Stress-testing brings out the best and the worst in people. In the Old Testament, God's favored people, the Jews, were periodically beaten down like nobody's business. How else was God to separate the wheat from the chaff? In case you don't want the souvenir, I hear wheat berries are damn tasty.